We believe that people everywhere want the same thing essentially: the opportunity to build a better future. And, we believe that we can help. We start this at local level by listening carefully and working to understand what various individuals & communities want and need. We work with the local leaders towards building community organizations, prioritizing goals, and recruiting allies and partners from government, the private sector, and the non-profit organizations. We help to identify the sources of funding, offer mentorship, networking opportunities, and support the development of truly sustainable programs. While our vision is aspirational, our mission is truly focused, community-powered and process-driven. We support the needs of local communities as defined by community members themselves—not by us. We know that the local leadership, their emotional commitment, realistic goals, sustainability and measurable results are essential for overall success. Early success builds everyone’s confidence—inspiring future success and lasting change. We are committed towards this work because each of us is inspired by our own families, the neighbors, the communities where we live, and by the belief that there is no higher purpose or meaning in life than to learn from one another, and in turn to help those around us to grow, to thrive, and to succeed. 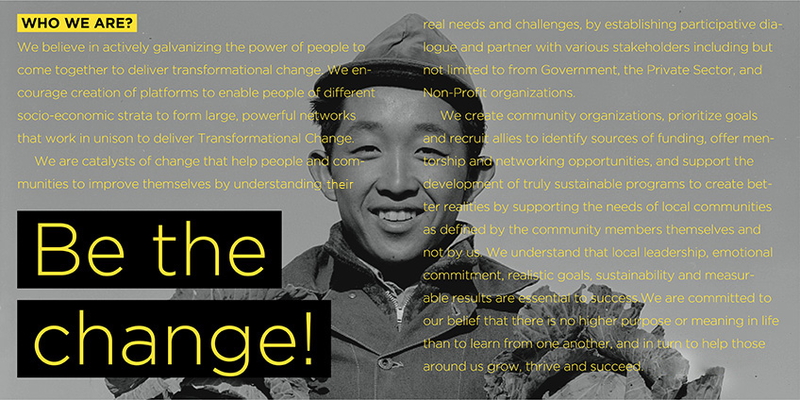 The Delivering Change Foundation helps communities around the world to change themselves for the better.